Mike Rosario, the Teaching Pastor at GBC, traveled the world as a young child courtesy of the U.S. Air Force. His father was stationed last at an air base in Medical Lake, WA (near Spokane) where he retired in 1986; the family stayed. Mike attended Spokane Falls Community College and Eastern Washington University before marrying and moving to Phoenix, AZ area to continue his pastoral training. After graduating from Arizona Bible College, Mike moved back to Spokane, WA to complete his pastoral training. In 1999, he was ordained at Faith Bible Church, Spokane, and served there as an Associate Pastor. 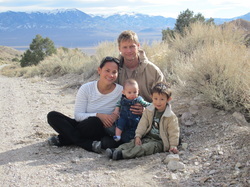 In 2000, Mike took a teaching pastor position that moved he and his family to Fallon, NV. 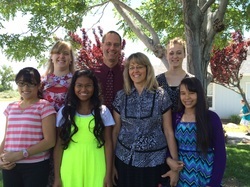 Mike, Jill, and their four children currently reside in Fallon and have the privilege of fellowship with the body here at Grace Bible Church, Fallon. Some of Mike’s favorite authors include John MacArthur, John Piper, J.C. Ryle (1800’s) and Thomas Watson (1600’s). Mike Springfield did most of his growing up in Medical Lake, Washington. He earned his bachelor’s degree from Whitworth College, while pastoring Junior High Students there at Faith Bible Church in Spokane. After marrying, he moved to Southern California and attended Master’s Seminary to continue his pastoral training. Following seminary, he and his growing family lived in Phoenix for a time where Mike led a Bible Study and taught classes at East Valley Bible Church in their pastoral training institute. Mike has now settled in Fallon, Nevada, with his wife Amiee, and four children and works at Coeur Rochester Mine as the Human Resources Manager. He was ordained as an elder in 2007 and counts it a great privilege to minister to the body of Christ at Grace Bible Church, Fallon, alongside his lifelong friend Michael Rosario. Joel Dunkin grew up in Fallon, Nevada. In 2000, he began to lead and teach in youth ministry and to pursue further training and equipping for pastoral ministry. During this time, Joel also attended the University of Nevada, Reno. He graduated in 2006 with a bachelor's degree in Communications and Writing. Joel was ordained as an elder of Grace Bible Church in 2013. He currently works at the Coeur Rochester Mine as an Environmental Coordinator and lives in Fallon, Nevada with his wife, Shannon, and their six children.